Let’s just roll back in time a few days to Saturday…after two weeks of being stuck in the house with three sick little boys (and being sick myself) I was, oh let’s say, a little cranky. So my husband did what he knew would cheer me up-took me to the Habitat ReStore for a little chair hunting. I was not impressed. 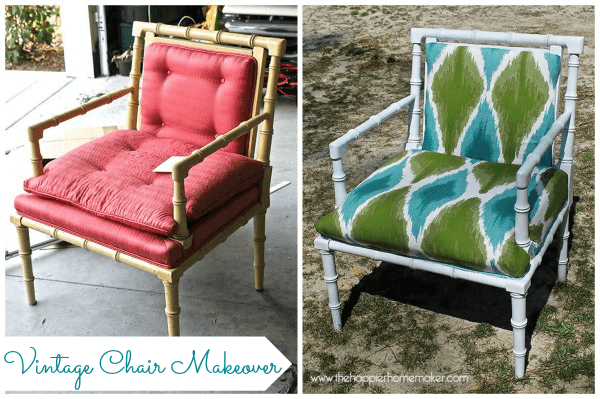 I mean, sure, the bamboo bones of the chair were pretty awesome. But do you see all that upholstery? And, well, it was a little smelly. And pink. And did I mention smelly? 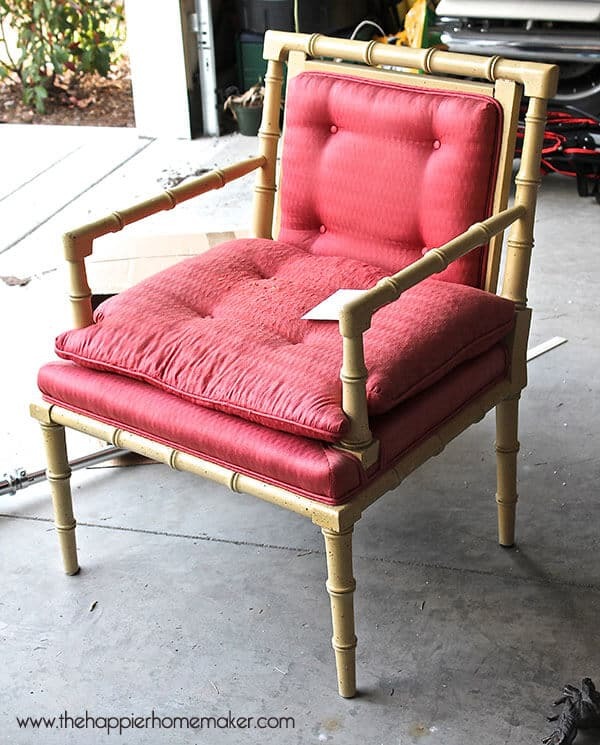 It was priced at $35 but the store was 25% off so he convinced me it was a DIY goldmine-it would be a practical DIY blog crime to pass up a chair like this. So into the van it went. This could have easily been one of those projects I shove into the depths of the garage for months except that my husband had a long weekend off work and he’s no procrastinator (like me) so this little baby got a fast makeover. The first thing to be done was strip that nasty pink upholstery off. Then it got a coat of white spray paint. I bought some foam to replace the bottom cushion which was too nasty to save. Because the chair will be outside (although in a covered area) I used plastic to cover the foam just in case. It was looking much better already but the real excitement came when I started to reupholster it-I bought this awesome shower curtain at Target just because I loved the pattern so much and knew it would look amazing on this chair. I can’t say it was the most fun process of my life but the end transformation was 100% worth it. 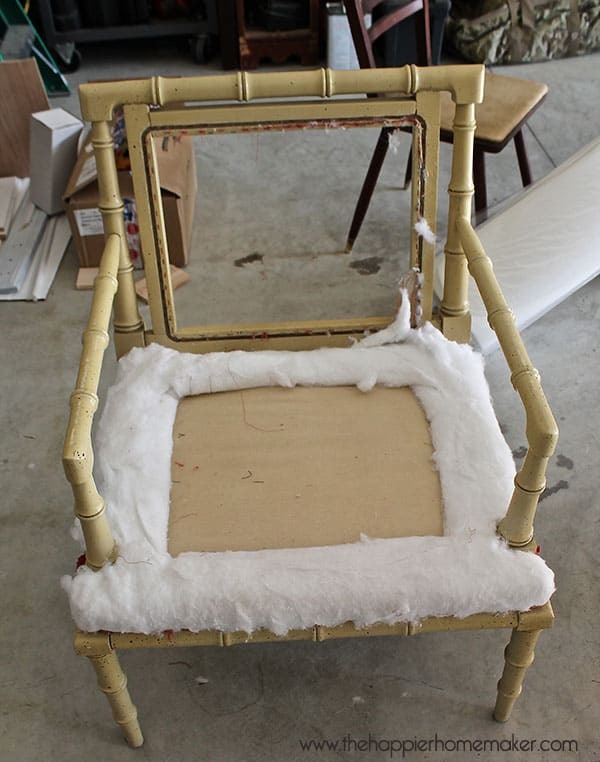 To upholster the back of the chair I first stapled the fabric to cover the back. Then my husband cut some plywood to the size of the opening (the original has just some cardboard inside) and I used more foam to upholster the plywood. Then we screwed it into the back of the chair. 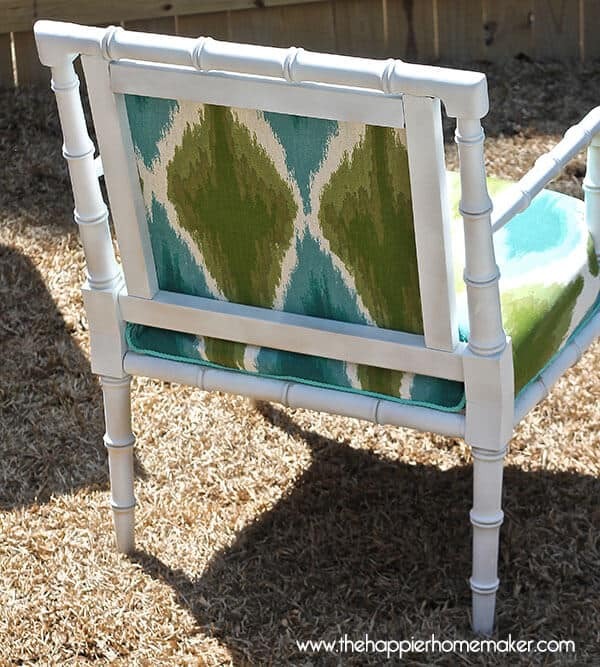 To finish it off I used some braided turquoise cording to cover the staples around the bottom cushion. Do you love it as much as I do? It’s going to look amazing in our new outdoor patio dining area…we’ve been working so hard on it and I can’t wait to show you the rest. 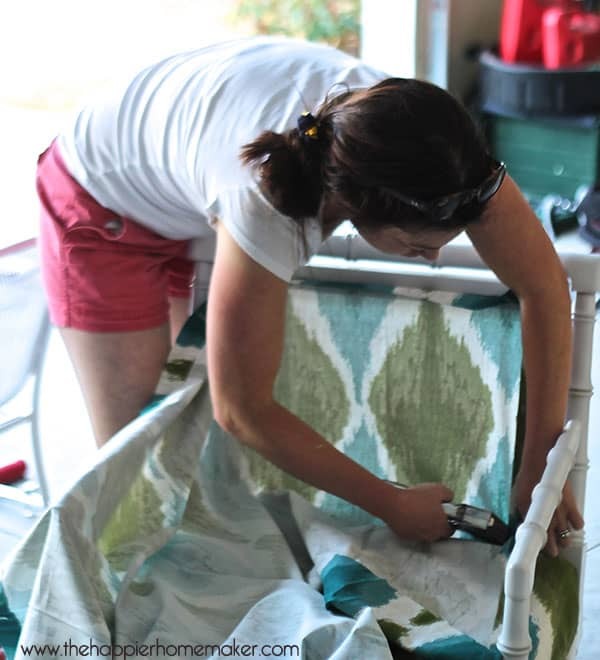 Tomorrow is the DIY dining table so check back! Great chair and fabulous idea to use a shower curtain! 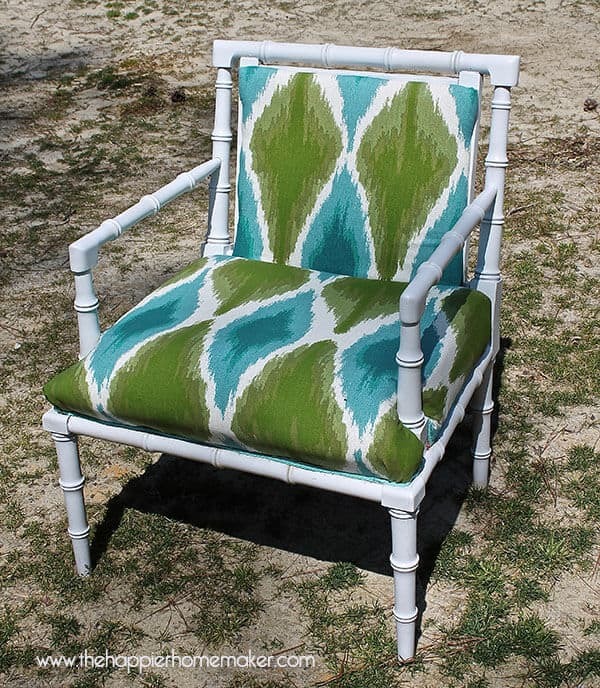 LOVE that Ikat style pattern. The white version totally looks like PVC pipe.